Please excuse my lack of post today- I am in major overdrive mode searching for just the right bedroom inspiration photos. Its like every other day of the year I have a clear vision, but WHY when I actually go to do something on my own house I get major ADD?!? 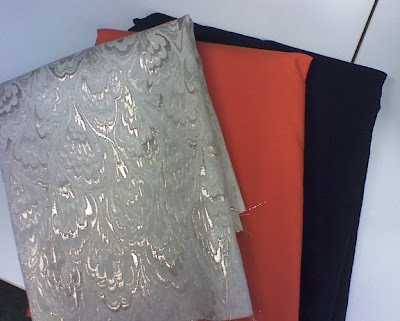 More orange, navy and some pretty gold/silver/cream textured fabric. I have a hard time trying new things it seems. I'm having issues today and it wouldn't surprise me if I found myself back at Homegoods buying those orange lamps that I don't need whatsoever! So you see my issues here, written out for all to see- so please excuse my lack of post. I'm feeling the same way right now about my bedroom. I had plans for that room. Big plans. Now, not so much. That's one of the reasons why I have not posted anything this week. And you mentioned ADD...girl I just took an online quiz on adult ADHD and the results were: You (I) possibly have ADHD!!! Great, just great! Go for those lamps. We loved them, sorry. My dining room has been a blank slate for 2 years now. I finally know a direction I want to go, but I've been sitting with it for a while to make sure I really like it. Ah decisions are the worst. I love that silver fabric! so gorgeous! Oh my word. That "mattelasse" fabric is super cool. A jazzy life is surely a blessing! aren't fabric stores so much fun?! I get lost in craft stores...LOVE that fabric! I totally do the same thing. I think because when we post inspiration or a blog post we are planning, kind of step taking. I think I need to do a plan when I am redoing something in my home and that way I wont be so scatter brained. It seems silly I dont since when I do design projects everything is organized and planned thorough. Oooh, can't wait to see what you do with those fabrics. The shiny one looks like it'll make a great accent! I think this happens to all of us! It's so easy to pick things out for others, but when you have to LIVE with what you choose (for possibly a long time), then it gets tricky. I always find myself wondering if I might find something better?? I also get tired of things really quickly, so the key for me is having small elements that I can change easily for a new look. I love love love love the orange though!! I'd totally have an orange couch, like from your previous post - I love it. But, Chris doesn't love it so much, so I only have small doses of it now. (*tear*). I say, if this is what you're drawn to, then don't fight it. Maybe if you want something different, try using different shades and tints of these colors - like a lighter blue or apricot? ?